There are many ways to track the seasons, the calendar being only the most obvious and arbitrary. I track the seasons by how my house stays warm and cool, and how I stay warm and cool in it. Let’s begin with spring, which is heralded by Furnace Stays Off Overnight Day. As the days warm, there’s Attic Fan Kicks On Day, followed fairly soon after by A/C Kicks On Day. The passing summer is marked by Removing Wool Blankets from the Bed Day, Lisa Turns Off the Heating Pad at Her Feet Night, Attic Fan Kicks on Before Noon Day, and A/C Runs All Night, which usually occurs at the zenith of the Hot All the Time season. As the summer wanes and the days cool, we see the A/C Stays Off All Day, after which we usually get at least a couple of gloriously temperate weeks when I don’t have to either heat or cool the house and that is our favorite season. But before you know it, Furnace Kicks On Day rolls around, and that means Cold All the Time season is just around the corner. 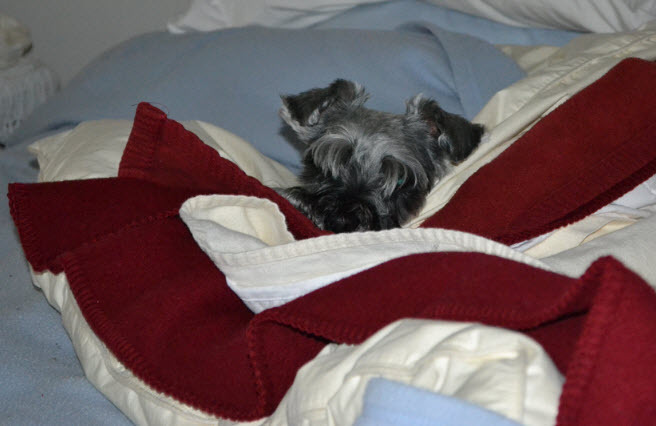 Eventually I have to put the wool blankets and heating pad back on the bed, usually around Doggie Daytime Warming Station Activation Day (when I put a heating pad under a blanket on the couch to keep them from getting chilled). And so begins the long cold stretch when the furnace runs continuously, the heating pads are in place all day and all night, and the piles of blankets on the bed and a lot of snuggling together for body heat manage to keep us all from shivering ourselves senseless at night. This year the weather has been out of order for months, so today was A/C Kicks On Day with a vengeance, which should not be here for another couple of weeks. 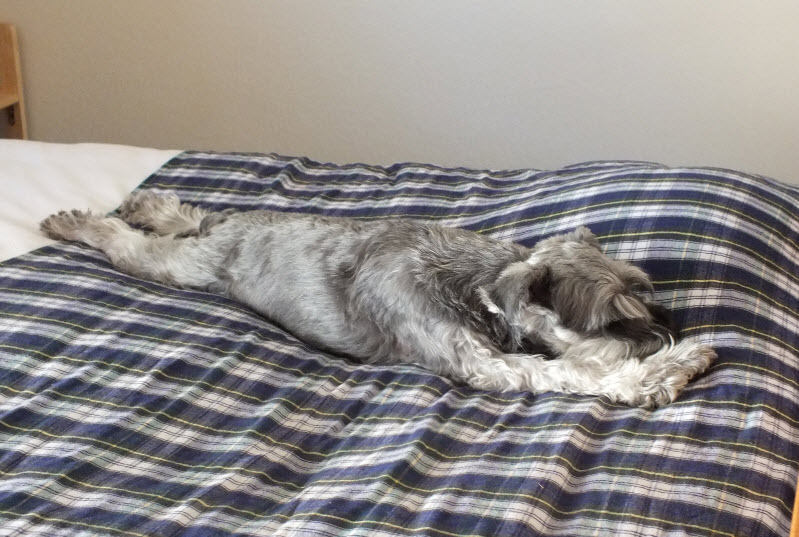 I can tell it’s too hot when I find Rudy stretched out like this on the bed. It already looks like it’s going to be a long A/C Runs All Day and Night season in these parts. We’ll do our best to keep cool. This entry was posted in Dogs, Domestic Affairs, Original Photos, Weather and tagged seasons, weather by Lisa Shaw. Bookmark the permalink.